The Environment Agency is reminding anglers of the importance of having a rod licence after successfully prosecuting 14 men last month. The Environment Agency is reminding anglers of the importance of having a rod licence after successfully prosecuting fourteen men last month. The anglers were caught committing the offences in 14 separate incidents across the North East in July, August and September last year, including three in Hexham, and one each in Bellingham, Harlow Hill and Wylam. They received combined fines of £3,749, including £1,784 in costs and £300 victim surcharge. All pleaded guilty with the exception of two who were found guilty in their absence. We’ve started the year as we mean to go on – taking strong action against illegal fishing. The majority of anglers fish legally and purchase a rod licence. Those that don’t are cheating their fellow anglers and endangering the future of the sport. In addition rod licence cheats risk a criminal conviction, a significant fine and could lose their fishing equipment. 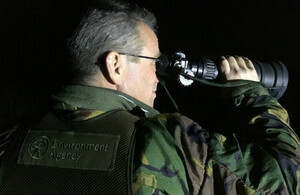 The Environment Agency carries out enforcement work all year round. Fisheries enforcement work is intelligence-led, targeting known hot-spots and where illegal fishing is reported. Buying a rod licence is quick and easy – you can buy them online at Gov.uk. Anyone witnessing illegal fishing incidents in progress can report it directly to the Environment Agency hotline on 0800 80 70 60. Information on illegal fishing and environmental crime can also be reported anonymously to Crime stoppers on 0800 555 111.